Data from NASA’s Moon Mineralogy Mapper (M3) aboard the Indian Chandrayaan-1 probe has shown that there is water locked in mineral grains on the surface on our satellite’s surface. Scientists had previously thought that the small amounts of moisture they could detect were all being generated by solar wind and other external factors, but the latest findings are strong evidence that the Moon contains large quantities of its own "magmatic water" from deep within its core. 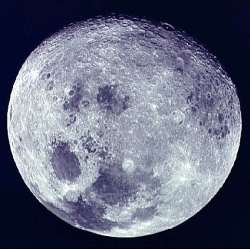 While the Moon is traditionally thought as a bone-dry place, the evidence for water on its surface has been piling up for decades, although it has been dismissed multiple times. Four decades ago, the rock samples brought back to Earth by the Apollo astronauts were shown to contain surface water. However, it was assumed that the samples had been contaminated by human handling, and the results were dismissed. In 2009 NASA’s M3 module in the Indian Chandrayaan-1 probe found water near the poles as it mapped the Moon’s surface, but this moisture was assumed to be caused by solar winds. Charged particles from the Sun can create thin layers of water molecules on impact, and scientists believed that the small quantity of water that was found could be justified in that way.